Coconut oil miracles, fallacious thinking and building foundations. So why are we taking overdramatic statements which have not been backed up from people who are selling the product or have something to gain as fact in the world of natural health, repeating these claims as if we’ve looked in the basement, when in fact we often haven’t even opened the front door? For example, I frequently hear that oil pulling is miraculous, but you absolutely must spit out the oil after swishing as “it is FILLED with toxins”. What are all these toxins? How does coconut oil pull them out? Where did they come from? Come on, people. The reason why this is a problem is that it turns many more realistic people off, makes it much easier for them to dismiss alternative medicine in general, and allows us to live in unexamined delusion. Additionally, it obscures the basic idea that coconut oil may have some basic benefits in helping to reduce certain types of gum and skin inflammation. If a claim is true but the foundation of it is fuzzy logic or magical thinking it is no better than a beautiful home built on a termite-infested base. It is easily knocked over. If a claim is exaggerated it shows an inherent under-confidence in the claim. I often feel like IF the solutions alternative types are bringing to the table are so great THEN we do not have to use words like “miraculous”, “magical”, “the one solution” and so forth. LET THE REMEDY SPEAK FOR ITSELF. Because plants and foods have properties, they will stand or fall on their own merit in practice, and do not need fallacious thinking to promote them. We in the natural health community often give those who dislike us on principle a proverbial box of ammo to use against us by failing to use logic, relying on fear-based tactics, denying basic scientific principles and/or failing to call out absurd marketing claims. Perhaps we should reconsider this approach? Let’s stop trying to get blog clicks at the expense of reason. Let’s recognize that integration may be more valuable, long-term, than separation. Let’s recognize that some of our promotional materials make us, as a community, sound like judgmental douchebags. And let’s let go of the naturalistic fallacy and open our minds to helping to discover what works best, which I believe includes plant-based medicine in many cases, as well as standardized medicine, movement, community-building, nutrition, addressing systemic and environmental issues which contribute to health outcomes and, occasionally, just letting people be heard. Ultimately, let’s examine our motives. Are we trying to advance care for our community? Or are we trying to be rock stars? What unfolds as we build this house will depend in many ways on whether to not we are building our solutions on a strong foundation or on a slidy pile of sand, so let’s consider that next time we combine our hands, a laptop and an idea, eh? Addendum: Please don’t think I am against case studies, narratives or personal stories, but I think they need to come with FULL disclosure and I think “It worked for me, I don’t know why but you could look into it and try it of you want” and “I heard it cures cancer” and “It is a miracle and you must use it now” are extremely different types of statements. Words have meaning, people. Thank you–as always–for articulating with both humor, eloquence, and compassion the complex frustration that I feel when the hundredth person emails me a link to the “article” SCIENCE CONFIRMS TURMERIC AS EFFECTIVE AS FOURTEEN DRUGS–or some other such thing. Love your writing, posts, and insights Tracy–keep the wisdom comin’! Except that there IS evidence showing that oil pulling improves dental health. While I get the overall point that we should make sure ‘natural health’ claims are sound before spreading them, quite often there IS evidence backing it up and it is simply the case that people don’t bother to look before ‘debunking’. Where do I say “there is no evidence that coconut oil does not improve dental health”? If I do say that, please point it out to me so I can examine it. Good blog. I agree. Let’s put things in perspective. Maybe it does help with dental help. If that is the case that can be stated. Full stop. Not more, not less. 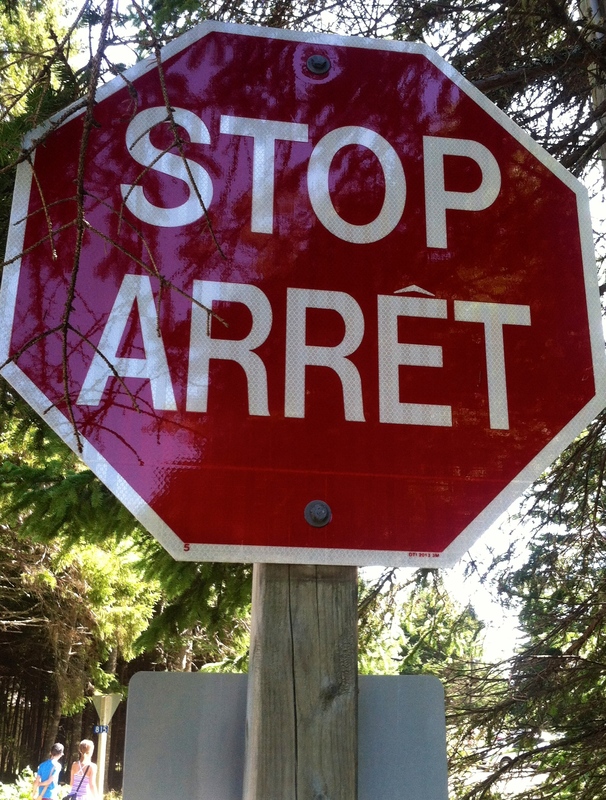 And the stop sign is from Quebec? That is where you see those road signs. Good eye! It is from New Brunswick. One source of “toxins” in the mouth would be the waste products from the less-friendly bacteria and yeast and such that live there, especially first thing in the morning. Depending on what an individual has growing, they could be unpleasent to the system! I am aware that some people say that, but to me this is very unspecific and I find it to be a confusing statement which I believe creates the idea that we are dirty and toxic. Therefore, I am advocating that we examine it. I bet the reason coconut oil works is not because it “pulls” out toxins, but because it has a mild antimicrobial/anti-inflammatory action. Probably we could duplicate the benefits of coconut oil on the mouth by brushing with yarrow, cayenne, turmeric, rosemary, cinnamon, etc. I think it depends on what we are saying it “works” for. But there are a lot of things we can brush with. I personally can’t imagine enjoying brushing with cayenne, and I use Colgate toothpaste. So I think people should experiment–but ultimately, this is also about marketing and truth-telling.